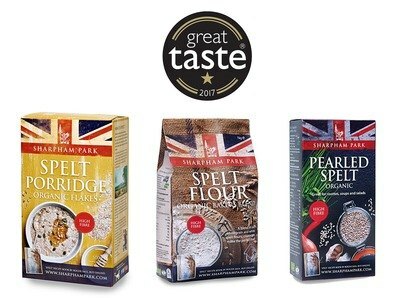 We're delighted to announce we've been awarded a 1-star Great Taste Award which means judges claim Organic Pearled Spelt, Organic Bakers Blend Spelt Flour and Organic Spelt Porridge Flakes simply delicious! The judges were impressed with three of our products and in particular; Organic Pearled Spelt, "A fine looking rice alternative...We like it, and we like the fact that there are many dishes that could be created with this". Over 12,300 products were judged by over 500 of the most demanding palates, belonging to food critics, chefs, cooks, restaurateurs and producers, as well as a whole host of food writers and journalists, Great Taste is widely acknowledged as the most respected food accreditation scheme for artisan and speciality food producers. As well as a badge of honour, the unmistakeable black and gold Great Taste label is a signpost to a wonderful tasting product. We decided it was about time we claimed one of the finest titles in the food industry after winning gold in the Great Taste Awards this year. There were 12,366 Great Taste entries this year and the panel of judges included well-known names such as MasterChef judge, Charles Campion, author and chef, Zoe Adjonyoh, and food writer, Martha Collison as well as food buyers from Fortnum & Mason, Selfridges, and Harvey Nichols.